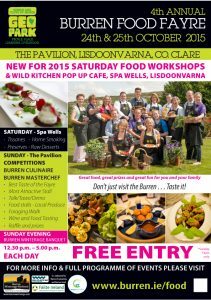 The Burren Food Fayre is held on October bank holiday weekend and has a range of local Artisan Food Producers, cookery demonstrations, talks and tastings. 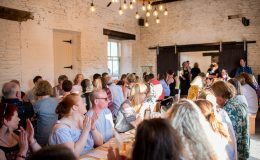 The Burren MASTERCHEF competition is one highlight with categories for Secondary Schools and Adults, all are invited to participate – fabulous prizes to be won! 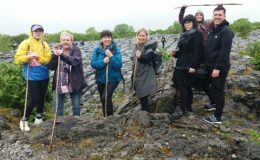 In the morning you can take part in Cattle Droving from Fanore to the Winterage above on the Burren and then head for Lisdoonvarna for your lunch and some fun at the Burren Food Fayre starting at 12.30. 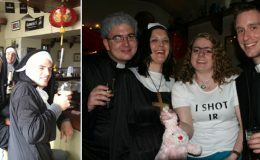 WORKSHOPS COST €10 with a reduction for two or more. Register at the information desk in the foyer. (Limited Spaces). Sponsored by the Lisdoonvarna Community Council. 12.30 p.m. DOORS OPEN FOR THE FOOD FAYRE, FREE ADMISSION AND PARKING. Food Stalls of Local Produce and Tastings. by Jim McNamara, Education Director (retired), An t-Ionad Glas, The Organic College, Limerick. 1p.m. COOKERY DEMONSTRATION BY CHEF PETER JACKSON OF THE ARMADA HOTEL. Seasonal dishes using wild local foods. Submit your precooked, plated, vegetarian dish for display and judging. Using local ingredients. Contact Eva on +353 868815974 for entry details. *A competition for Professional Trainee Chefs. 5.00 p.m. 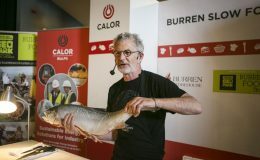 Announcement of Winners of THE MOST ATTRACTIVE STALL AWARD, The BEST TASTE OF THE FAYRE AWARD and THE BEST ‘BURREN BEILINI’ produced by a Geopark member. Judging panel led by Chef Peter Jackson of Armada Hotel. 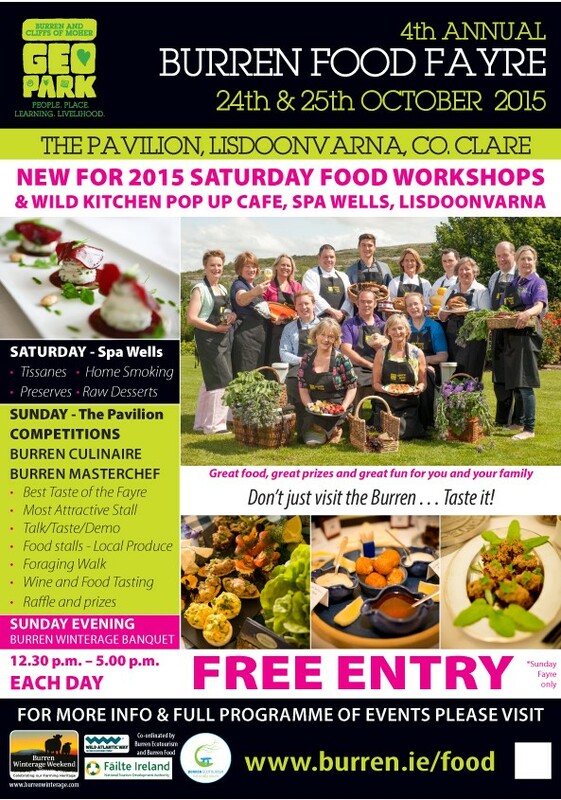 This event is organised by the Burren Ecotourism Network and Burren Food Trail in conjunction with Burren Beo Winterage Festival.